↑ نشان‌های دولتی در روزهای پایانی خاتمی و احمدی‌نژاد به چه‌کسانی رسید؟. Tasnim News Agency (in Persian). 24 August 2013. Retrieved 15 April 2016. ↑ "some books by M. E. Bastani Parizi (KetabNameh)". some books by M. E. Bastani Parizi. Retrieved 2008-02-06. 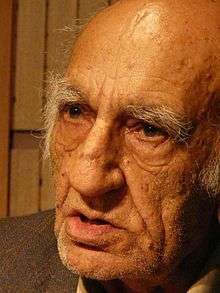 ↑ "Mohammad Ebrahim Bastani Parizi Passes Away". Majzooban.org. 18 March 2014. Retrieved 2014-03-26. Wikimedia Commons has media related to Category:Mohammad Ebrahim Bastani Parizi.